There are races you run for a PR and there are races you run for the fun of it. 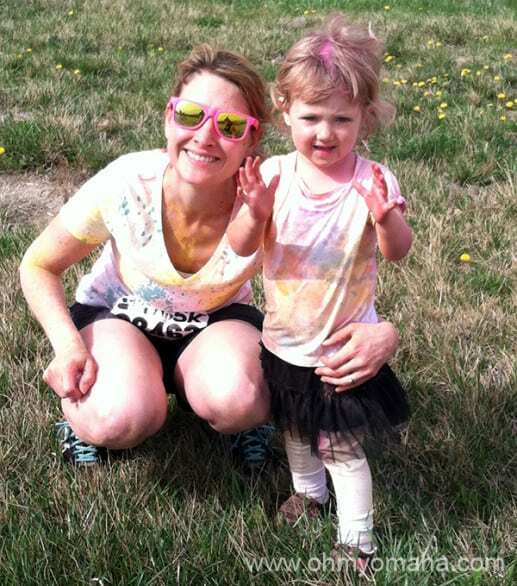 Color Me Rad 5k is for the fun of it. 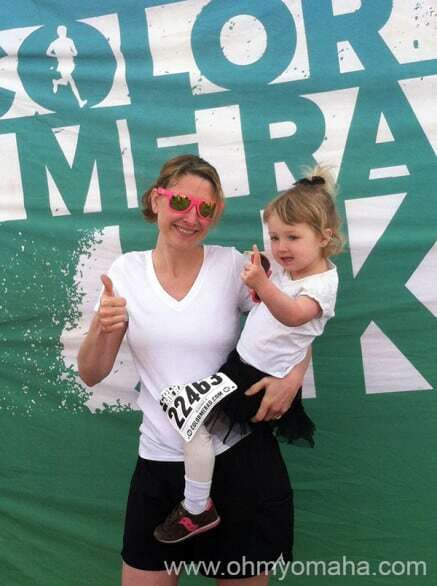 My intention for the race in Council Bluffs last Saturday was to toss aside my competitive nature and finish a race with my child. Mooch’s first 5K is in the books. Now she expects every race to feature neon and color bombs. My 2 and a half year old, Mooch, subbed in for her big brother. We’ll make a great team someday, once we straighten out the message we’re sending with our hand signals. My dad, Mooch’s Grampy, joined us. What a sport. My dad even wore the goofy yellow sunglasses I picked out for him. Our plan was to walk it all. Runners out there have probably stopped reading. This isn’t really a race recap; no racing was involved. Luckily, several hundred also opted to walk this 5K. OMG, these girls do not want their picture taken by me. Lots of families. Kids in strollers. Kids on leashes. Kids in wheelchairs. And grandparents, I loved seeing other grandparents out there. My dad marveled at the age and ability ranges on the course. No one felt embarrassed by walking. Can any age do it? You bet. Mooch didn’t last long in the stroller, and was out pushing it three minutes after we started. 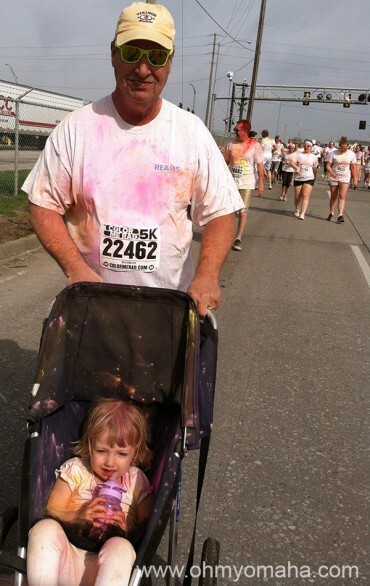 She was not scared off by the color bombs thrown at us at each color station. She ran to those color stations. She walked more of the course than I ever anticipated. I carried her for some of it – and we pushed her for some of it – but she did me proud with the distance she covered on her own two feet. And so did my dad. 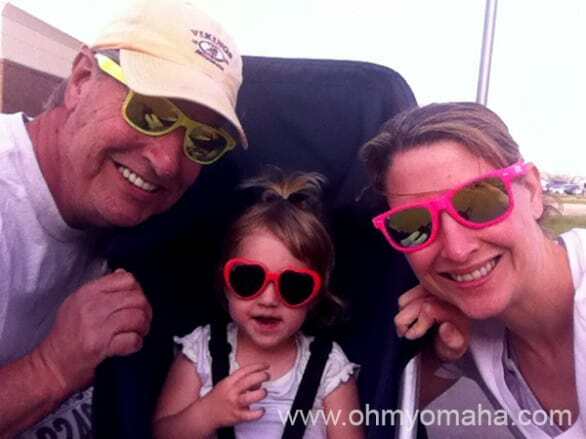 Grampy was a good sport, even wearing the silly yellow glasses I picked out for him at the packet pick-up. 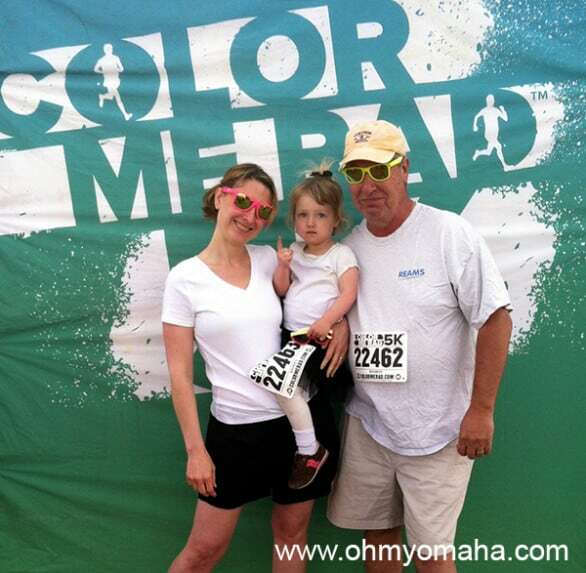 So, if you were uncertain if running a 5K as a family would be fun, let me assure you it can be. And messy. It won’t be long before this little munchkin will outrun me. Rather not bring the kids? Don’t blame you. The image of you in a tutu making angels in yellow powder would probably haunt them for life. 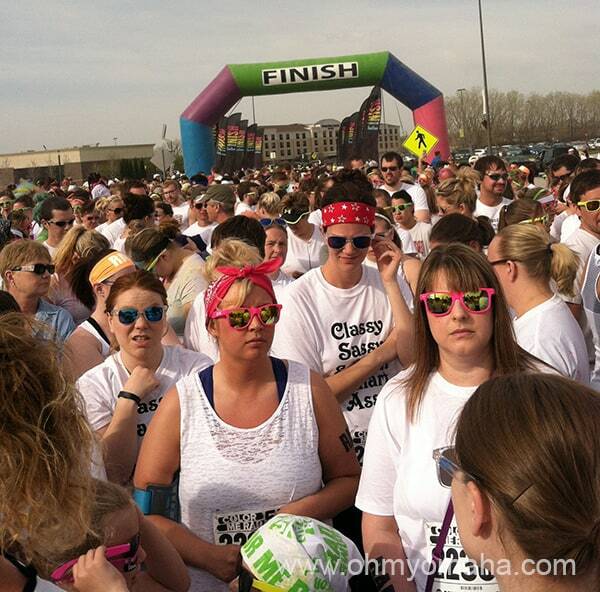 This race is probably more fun with your crazy friends. Far more people were out there in herds of friends (just look at them all in their merriment). While I met up with some friends before the race and saw some old friends during the race, Saturday was primarily a family day for me. This might be my dad’s first selfie. That’s my sort of fun these days anyway. 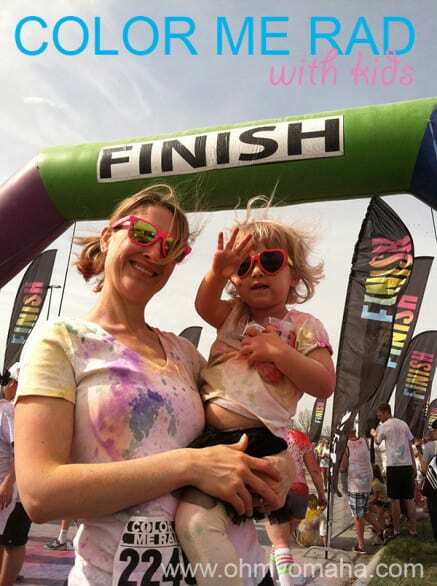 Disclaimer: Many thanks to the Color Me Rad 5K race organizers for providing two entries into the race in exchange for blogging about it before and sharing my experience of it after. All opinions expressed were mine. Thanks, Erin! It was good to see you guys too! Looked like you had a lot of fun at the race. Do the color bombs hurt? Not at all. It’s pretty much powder.